“Shift” is the title that Constance DeJong has chosen for her upcoming exhibit at Charlotte Jackson Fine Art in Santa Fe. 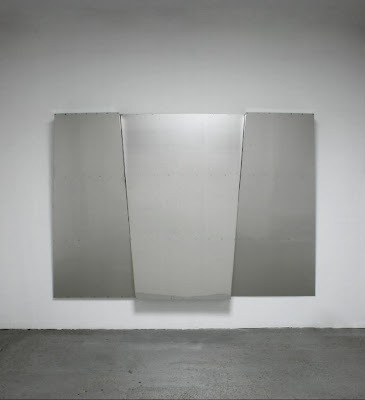 Shifting planes of sheet metal have long been an essential feature of her art, forming the basis of its austere beauty. This time, the installation will itself shift between two distinct bodies of new work. 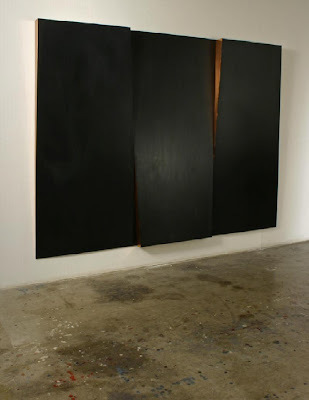 One room will contain two massive, monolithic wall sculptures of blackened copper that take on the character of brooding expressionist paintings. In the adjacent room, virtually the same sculptural forms shift from absorbent black to the dazzling silver of light-reflecting aluminum and stainless steel. In each room, the large works will be accompanied by a series of smaller framed pieces that explore the further possibilities of their respective materials and format. De Jong’s black pieces are composed of sheets of burnt and burnished copper. The painterly effect of their blackened surfaces results from a poured chemistry, which darkens into crusty velvet as it interacts with the copper and retains a waterfall’s downward drift, lending weight to these moody compositions. Using a mathematical proportion, DeJong has divided the basic rectangle of the monolithic form into three interchangeable sections. She then tapered and tilted the planes, angling them like Egyptian pylons and allowing hints of unstained copper to glow along their wedge-shaped edges. Flares of coppery light also seep through the atmospheric black patina, suggesting an inner fire and recalling the somber romantic paintings of Robert Motherwell, Marc Rothko, and Barnett Newman. DeJong has used similarly treated copper plates to produce her smaller accompanying works. She refers to these too as “paintings,” only shifting their scale upward by a factor of ten to achieve her monumental statements. If the black pieces address painting issues, the silvery metal works in the adjacent room enter into a dialogue with drawing. Indeed, these large steel and aluminum forms are simply the naked understructure that De Jong builds and ordinarily covers with copper sheets. In a sense, they are like an underlying sketch or cartoon. But she has chosen instead to work the surface of this huge understructure, lightly grazing it with a grinder, so that light glints across the feathered texture and radiates outwards. The tiny ranged hairlines left by the grinder are like a draftsman’s hatch-marks, scattering the light. In the smaller works in this room, DeJong recreates the effects of exquisite graphite drawings. In an intricate interplay of silver and white, she employs metal plates and sheets of translucent or clear mylar to make subtle surface planes that cast softly graded shadows. Delicate wire screens reproduce a kind of cross-hatching. Complementary in their approach to light and dark, DeJong’s two bodies of work shift between alternative states of the soul: If the black artworks, with their coppery sparks of internal fire, contain the dark and inward brooding of the earthbound mind, then the silvery ghost forms of the second room’s burnished metal can imply an altered state, a hovering ephemeral spirit released into transcendent light.